Lovely looking white gold and diamond bangle. hallmarked 375 birmingham makers mark MST. this is in a presentation bangle box and has only been lightly worn. with a good hook over clasp. I purchased this bangle in the UK from a jewellers. It’s stamped 925. Lovely wave effect bangle with six diamonds. Dispatched with Royal Mail 2nd Class signed for. 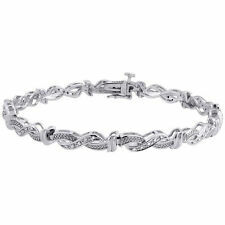 A BEAUTIFUL NATURAL DIAMOND STERLING SILVER KISS LINE BRACELET. SET WITH NATURAL DIAMONDS. Lovely 18ct white gold bangle set with 3 genuine Diamonds. Weight: 9.85 grams. Very good condition minor surface scratches. 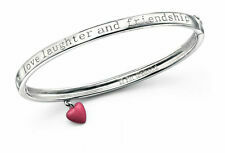 Official Welsh Clogau Gold Silver & Rose Gold Eternal Love Bangle £140 off! Every piece of Clogau jewellery contains rare Welsh gold from the Snowdonia mountains as used by the British Royal Family - the Gold of Royalty for over 100 years. 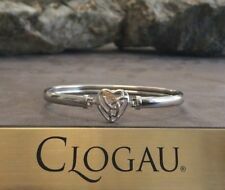 We are Clogau, we operate in the Clogau head office in Bodelwyddan North Wales. A very elegant Annoushka 18k yellow gold and grey diamond oval bangle that sits beautifully snug on the wrist, with a side opening snap clasp. Looks lovely on its own or stacked. Barely w o r n. ( N o p a c k a g i n g). Elegant Silver Bangle - Diamond Dust. Condition is Used. Dispatched with Royal Mail 1st Class Large Letter. A BEAUTIFUL NATURAL DIAMOND STERLING SILVER SLAVE BANGLE. SET WITH 5 NATURAL DIAMONDS. IN GOOD CONDITION. The bangle is set in 9ct yellow gold with the diamonds set into 9ct white gold. 9ct Gold 0.11ct Diamond Bangle. The bangle is marked 375 (9ct Gold), (0.11ct of Diamonds). This dazzling bangle is set with 11 sparkling Diamonds - with a total of 0.11ct. 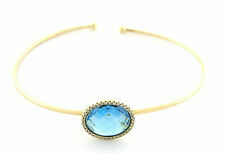 9ct Yellow Gold Sapphire & Diamond Bangle. Excellent Condition - UK Hallmarked for solid 9ct Gold. Maximum width of bangle - 4mm. Weight of Bracelet - 5.2 grams. ~~~~~~~~~~~~~~~~~~~~~~~~~~~~~~~~~~~~~~~~~~~~~~~~~~~~~~~~~~~~~~~~~~~~~~~~~~~~~~~~~~~~~. ❤️Beautiful 4Ct Diamond flower style Diamond Bangle set in 18K yellow gold finish round signity diamond all over It clip opening closed The bangle is 62 mm by 52 mm and 3.8 mm thick and weighs 14.5grams. 9ct Yellow Gold Ruby Bangle. Excellent Condition - UK Hallmarked for solid 9ct Gold. Maximum width of bangle - 10mm. Weight of Bracelet - 9.0 grams. ~~~~~~~~~~~~~~~~~~~~~~~~~~~~~~~~~~~~~~~~~~~~~~~~~~~~~~~~~~~~~~~~~~~~~~~~~~~~~~~~~~~~~. Hallmarked for 9ct solid gold. The bangle will arrive in a gift box. Belles Jewellery Box. """""""""""""""""""""""""""""""""""""""""""""""""""""'. Stones are of excellent quality and are professionally inspected. 9 Gorgeous large MYSTIC topaz set in SOLID 14 CARAT gold bangle, a really beautiful piece . stunning sparkle from the gems that really catch the light. A Genuine Sterling Silver 925s Round & Baguette Bangle Bracelet for Bridal. Baguette --> 4.00 ct. Gem Type --> Lab created. Round Stone --> Rounds (3.05 Ct.). An Elegant and Luxury Jewelry Box. Country of Manufacture --> India. Ladies 18ct white gold cut channel set diamond bangle. 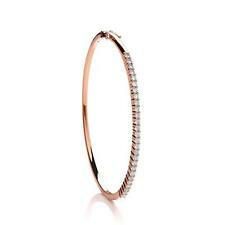 Ladies 18ct gold brilliant cut channel set diamond bangle. Set with approximately 0.84ct in total in a channel halfway round the bangle with a plain 18ct white gold back. Condition is New with tags.In original box with valuation certificate. Replacement value is £2500.00 Dispatched with Royal Mail 1st Class. It weighs approx 11.3 gm and is approx 7 mm wide at its' widest point across the top of the bangle. Sterling Silver Simulated Diamond Spanner Bangle. Item is UK Hallmarked for solid Sterling Silver. ~~~~~~~~~~~~~~~~~~~~~~~~~~~~~~~~~~~~~~~~~~~~~~~~~~~~~~~~~~~~~~~~~~~~~~~~~~~~~~~~~~~~~~~~~~~~~~~. A lovely bangle set with evenly spaced out round sparkly diamonds. Width of Bangle : 4.0mm. made with love by. Reference : 49296. 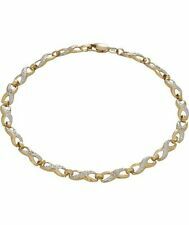 9ct Yellow Gold on Silver Ladies Expandable Bracelet. 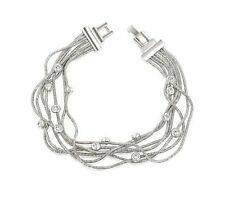 The bracelet features a crystal ball set with beautiful simulated round cut diamonds. Weight of Bracelet - 4.7 grams. Marked 925 for solid sterling silver. 14ct yellow gold with white gold rhodium plated accents. This is in excellent condition. There is six diamonds, sorry weight not known for diamonds. The bangle weighs 7 grams. The bangle is hallmarked and has been verified as 14ct yellow gold and diamonds at Ernest Jones, White Rose, Leeds. The size of the bangle when closed is 6.1 cms x 5.3 cms. Any questions please feel free to ask. Amanda Wakeley for Ernest Jones. Ladies Solid Silver Diamond Bangle Cuff. Weight 42g solid. 0.25ct Carat diamond Bangle stunning. 9ct yellow gold & Diamond Bangle 6.2 Grams. Attractive 9ct gold bangle set with 3 small diamonds in a modernist setting. Fully hallmarked for 9ct gold. Makers mark “P&D”. The bangle weighs 6.2 grams. Beautiful created diamond designer bangle white gold finish. Created with you in mind Simply elegant. 9ct Gold Bangle with Diamonds 0.50 ct Diamonds Good condition. Lovely 9ct yellow & white gold hollow bangle set with genuine Diamonds. Weight:10.90 grams. Excellent condition. Absolutely stunning baby bangle 0.50 ct of diamonds in 9ct white gold. Ideal christening present. Its 14gram solid gold so it’s a substantial piece of jewellery and not flimsy as most modern bangles can be. Beautiful sparkling stone aprox 0.75ct in solid 9ct Yellow Gold. hallmarked for gold and diamond. This is a 9ct white gold diamond bangle. The bangle opens on a hinge for easy application and the diamonds are set in 2 rows covering the front of the bangle. Total Diamond Carat Weight: 0.50 carats. 9ct White Gold Diamond Bangle. Secondhand in Gift Box. Bangle is Hinged, Fastens With a Tongue Clasp. Round Brilliant Cut Diamonds. Total Diamond Weight 0.34ct. There are a few that are not hallmarked, however they are sure to be tested. THE BANGLE BRACELET WEIGHS 6.5g. Diamond Clarity: VVS - VS. Total Weight of Bangle: 42 Grams. We do not believe in mass production, each and every piece is hand picked to ensure quality. The Diamonds are exceptionally bright and full of fire, the internal lustre is at its peak, very much lively stones.This is a very high quality piece. 9ct Yellow Gold Diamond Bangle. Excellent Condition - UK Hallmarked for solid 9ct Gold. Maximum Depth of the face of the bangle - 10mm. Weight of Bracelet - 7.7 grams. ~~~~~~~~~~~~~~~~~~~~~~~~~~~~~~~~~~~~~~~~~~~~~~~~~~~~~~~~~~~~~~~~~~~~~~~~~~~~~~~~~~~~~. Hallmarked for 9ct gold. A nice ladies 9ct gold diamond bangle. Approx weight of bangle 11.13 grams. The bangle is set with very small diamonds. The bangle as so often with this type is very slightly mishaped due to wearer bending it slightly to make a better fit. 18Kt Invisible Set Princess Cut NATURAL Diamond Yellow Gold Bangle 4.33CT 2.25"